As I walk down the steps to the basement of the Bloomsbury Bowling Arena, I am greeted with the sound of "The Champ" by The Mohawks, blaring out of the speakers, an MC giving it large, loud cheers and roars. The room is in semi darkness and it's difficult to make people out through the throng. There are two corners in particular where the crowd is at it's thickest. At these points there is a raised platform, stage lighting and a timing clock. What's all the fuss over that? Through the masses of people and bottles of beer you can make out the sight of bobbing heads and torsos. These are the roller racers. They pedal away madly as though their lives depended on it for the best part of 30 seconds. Their faces contorted with agony as they try and break the landspeed record with the circular motions of their legs. The fans go crazy, shouting and screaming at their roller racing hero to pedal harder, faster. The music changes from 60s funk to breakbeat drum & bass. The "soigneurs", shout out tips and timechecks at their "athlete", while holding the forks of the vibrating bike. The roar of the victorious rider's fans, the sight of the riders throwing their heads back to take in more air, and the decelerating beat of the music signifies the end of these mad 30 seconds. The DJ then dishes out some Schadenfreude by putting on "Loser" by Beck, as a way of commiserating with those who don't reach the following rounds. There then follows a short pause in proceedings before the next rounds, while riders and spectators alike hurry to get in their next round of alcoholic energy drink from the bar or have a fag break. 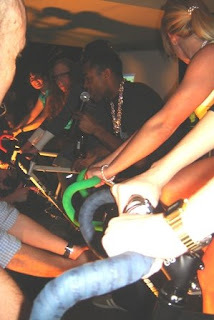 And that was the scene that I was met with on my first visit to the Rollapaluza "KingSpin" night. Roller racing has been around for years. I first heard about this activity in my second claim cycling club (Addiscombe CC), which until quite recently took part in the South London roller league. These weekly events were certainly social and fun, but they were a much more gentlemanly affair. It was more tea and scones and was held in such and such a community centre in a South London suburb. The folks were competitive, but there was no real gladatorial status for the winners. The fans cheered politely, and the average age of fans and competitors was about 45. Most importantly, everyone who competed was a club cyclist. Racers were lycra-ed up in their club kit, and would have trained for the event too. So the latterday roller nights are a complete departure from what I knew roller racing to be. In fact, the Rollapalluza nights are more of a throwback to the "Golden Age" of roller racing in the 1940s and 1950s, when a whole outfit, including a big band and dancing girls would travel around the country to dancehalls and put on a roller race. Members of the audience were invited to challenge a roller racer - in many cases, the then pro roller racer Eddie Wingrave - on the stage. Alot of Eddie's challengers were local telegraph boys, who carried out their work by bicycle. 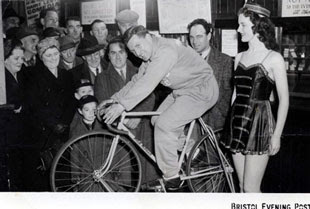 The initial interest in the recent revival of the events was mainly from cycle couriers, and Rollapaluza travels around the country promoting the roller races. 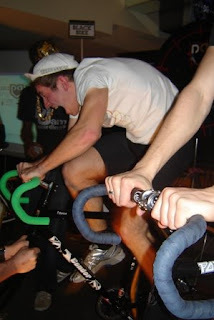 Although advance entry is encouraged for their higher profile events, it is still possible for anyone to get up on stage and race at the pub league events in London. So, apart from the dancing girls and big band, which are now replaced by a DJ and an MC, the format is largely the same. These evenings are ever popular and have proven to be a great evening out. The big events take place to sell-out crowds. 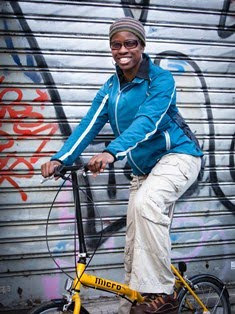 It's all part of the growing trend towards "urban cycling" and the "urban chic" trend. 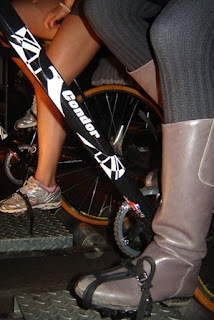 All comers take part - couriers (of course), leisure cyclists, WAGS, even club cyclists! The Rollapaluza events have attracted a share of celebrities too - Olympians like Chris Hoy, Craig MacLean and James Cracknell; rugby player Lawrence Dallaglio; and the BBC's Mike Bushell and DJ Nemone. This is a largely lycra-free environment. The majority of people do it in their civvies - jeans and T-shirt usually, but there's a whole manner of attire and footwear. Back to the evening's proceedings......There was an individual competition and a Madison pairs competion. It was done on a knock-out basis with qualifying rounds, quarter-finals, semi-finals and the climactic final, where riders compete for a share of the £2,000 prize fund. All the races were run over 500metres (denoted by the timing clock). The madison was run over 1000metres with each person in the pair doing 500m before handing over to their partner to do the remaining 500m. There was a separate men's and women's competition. So having all these races to get through made for a full evening's worth of racing. Racing was in progress from 7pm right up to 1am ! All shapes and sizes of racer stepped up on the stage, and displayed their pedalling prowess to varying degrees. Some of them, like Rachel P and Hill Billy are clearly regulars who take part in Rollapaluza's winter pub league. Watching their legs pumping at a rate of knots was a real masterclass in how to ride these competition rollers. What I found intriguing was how well some of the riders performed, even though to see them you wouldn't have thought it. You might get a plump bloke dressed in jeans and a bomber jacket, propping up the bar one moment, the next moment he's outside smoking. Then put him on the rollers and it's as if you had shot a massive elecric current through his legs. His spin is lightning fast, reaching speeds of 60mph. It almost hurts your eyes to watch! Activity was not just confined to the roller racing public. With an MC doing his tricks on the microphone, throwing out random quiz questions that the audience could answer in return for more beer, there was reason enough for everyone to be here! In parallel there was also a mini ten-pin bowling area too. While all this is very much the Rock'n'roll, non-traditional, non-conformist, "urban" end of the scale as far as cyclesport is concerned, it is nevertheless a pretty organised affair. The evening ran like clockwork and was well organised, right down to there being a secure parking area for the hundred or so who arrived by bicycle. 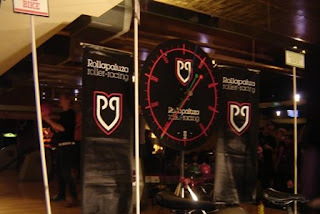 There is a Rollapaluza league that takes place in London pubs, complete with rankings. This format has even been exported across the pond, with Rapha sponsoring an event held in Portland, Oregon last year. I had a great evening out and enjoyed watching the various competitors - especially a few club cyclists I know who made surprise appearances in the competition! I wasn't ready to have a go myself - having only just gotten over a bout of tendinitis, and saving myself for a cyclo cross race meant that I wasn't really ready to compete. But I definitely want to have a go at a future event. And how does Cycling Plus magazine sum it up? "...30 seconds of the craziest legal and drug-free high. And best of all it’s on a bike…"
So who knows? 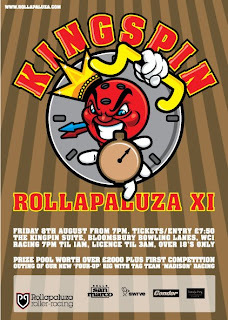 - Rollapaluza could be coming soon to a pub near you (or me)! I've never heard of roller racing before. Sounds like you had a really great time. I love your blog and writing and really admire what you do. Thanks cyclenewbie - I'd definitely recommend going to one - even just to watch if you get the chance. It was fun playing out in the snow yesterday - we just have to be careful on the ice today. and you featured me 3 times in your pictures. I was the blonde in the yellow and pearls. Hi Chloe, You're right - you feature a few times in the pics. Just a coincidence. Well done on your roller riding antics. If you pm me your email address via the ACC forum I'll send you the pics.